Andrew Sullivan comments on Sarah Palin’s latest vapid comments about — well, it doesn’t really matter what they were about, does it? And so you return to the Palin conundrum. The sheer crudeness of her rhetoric, the vast ignorance it champions, and the charisma of a beautiful white woman rallying heartland male voters against commie evil is a combination it’s simply impossible to grapple with effectively. She can plagiarize Slate writers in a stream of consciousness at the Wine and Spirits Wholesalers Convention, and chirpily host a clip show, and headline Tea Party events with writing on her hand … and somehow remain a credible figure, getting world-weary, post-everything encomiums from the likes of David Carr. And the sane WTF response — how does one do otherwise? — simply feeds the Palin media machine. 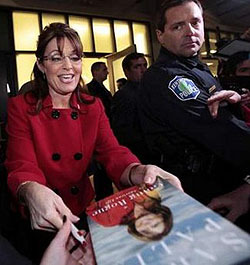 Palin is a media genius. She is a PR genius. My only question is whether she can keep it up. A big part of her success, I think, has been an instinctive notion of just how much exposure is enough, but that seems to be fading a bit. If she becomes a constant presence on our TVs, the way, say, Newt Gingrich is, she might not wear as well as she has so far. We’ll see.